For the 9094 ft, south-western summit - 9-o’clock from inside crater. Fabulous views of inside of crater, Bachelor and the Sisters. Climbing up the ridge was scarier than the wide slopes of Adams or St Helens - speed was checked by caution more than by physical effort. You should have this summit to yourself. Driving down early from Portland means you may not get a parking spot at the Dutchman Flats Sno-Park, and Mt. Bachelor doesn’t allow overnight parking. On the other hand, this allows time for other skiers and snowshoers to break trail for you. At the trail head, get each of the maps that are in boxes on the trailhead-sign. (Geo-Graphics’ Three Sisters Wilderness map doesn’t have all the Nordic trails in the right places.) On the Nordic map, Broken Top is off the upper left corner. Follow trails northwesterly, to Big Meadow Trail, then to snowmobile road going north. Depending on how you like snowmobiles, either break NW where road turns east or continue it to road 7 going NW. Continue NW to base of crater - around 6 miles total. Recommended: one ski pole (for balance) with your crampons, axe, and shovel (for snowpack testing). Upper slope on climber’s left averages 33 degrees. Take the SE-pointing ramp up to the South Ridge, then continue up as high as you can see. But wait - the summit is across a notch. Downclimbing was scary because of soft snow - I faced in and front-pointed. Stay behind all the boulders across the saddle - we stepped in front of one and put a foot into a hole at least 4 feet deep. Go to top. If white-out on descent, be mindful of the one sideways cut-out on the ridge - following your tracks will keep you from the drop-off. We’re in “off season” physical condition, so you may better our times: 4 hours up, 1.5 hours down, 3 hours back to car by snowshoe. Copyright, 2003 by Eric Seyler. All rights reserved. 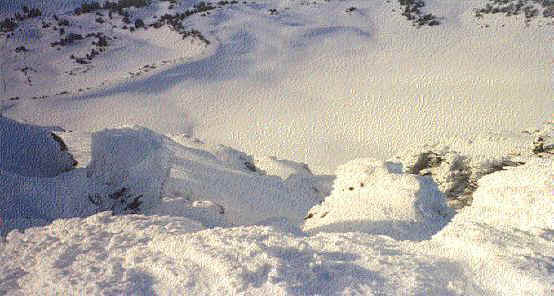 Looking down from the winter summit of Broken Top into the bowl. Photo Copyright© 2000 by Tom Michaelis. All Rights Reserved.